That fat man in a red suit at the mall? He stands for childhood. And magic. And the profits that can be made off the emotional baggage of the season. I experienced my first Christmas hangover when I was seven years old. It had nothing to do with alcohol. It’s the feeling I got after I’d opened all my presents and sat surrounded by them, knowing I should be ecstatic but instead feeling hollow with disappointment. The mood seemed totally unreasonable and my sense of melancholy was compounded by guilt. I now understand the hangover as a natural outcome of the tremendous emotional build-up to Christmas. To a child, Christmas is the ultimate holiday, complete with theme music, a parade, candy, decorations and a full day of unwrapping presents delivered by a magic flying elf. It’s no wonder that by the time Christmas morning dawned, I was so wired on impossible expectations reality couldn’t help but fall short. Over the years, my Christmas hangovers have subsided, but the holidays have yet to pass without a fleeting pang of emptiness in the pit of my stomach. Like so many adults raised on Christmas, I long to go back to those first, innocent years when all was beautiful magic and the best gifts were wrapping paper and boxes. This sense of nostalgia is powerful, touching and pathetic. It is also highly marketable. Every year, millions of children line up in malls across the continent to sit with a fat man in a red suit. It’s a bizarre ritual, this annual pilgrimage to hand our children over to appropriately attired strangers in the hopes they’ll smile while the moment is photographed. The weirdness is compounded by the fact that many of these scenes are played out on the turf of a small number of companies created with the express purpose of profiting from the emotional baggage of the season. In 2004, I was hired to manage the Santa Claus photo set at the Halifax Shopping Centre. From November 22 to December 23, I watched as shoppers from all reaches of Metro lined up for the chance to sit their offspring with one of my three Santas. Some kids bounced with excitement, others were shyly curious and still others turned beet red and shot burning tears of terror. No matter their child’s reaction, many parents forked over between $10 and $40 for photo packages. All told, it was much like any other Santa set in any mall anywhere in North America. This is not surprising. Just as you’d expect a Big Mac from McDonald’s in Halifax to taste the same as one in Vancouver, Santa photo-set operations are consistent across the country because many are contracted by the same company. But unlike McDonald’s, very few people have heard of Cherry Hill Photo Enterprises. Cherry Hill Photo Enterprises is the largest provider of Santa Claus photo-set operations in North America and most likely the world. The business first opened in Cherry Hill, New Jersey, in 1961 and has since expanded from its home base at 1200 Haddonfield Road into more than 400 shopping centres and department stores across the US and Canada. The Santa business is highly lucrative and Cherry Hill Photo can be conservatively estimated to gross tens of millions of dollars every year in the weeks leading up to Christmas. I received a $2,300 taste of multi-millionaire pie when I signed on to be Cherry Hill Photo’s local manager at the Halifax Shopping Centre. My experience began in early October with an interview by the company’s district manager for Atlantic Canada, a small-framed ball of nerves from Moncton named Edith. After presenting myself to the Halifax Shopping Centre for approval, I was flown to Toronto to attend two days of manager training in Newmarket, Ontario. The Best Western Voyageur Place Hotel at 17565 Yonge Street in Newmarket is the last place you’d look for the spirit of Christmas. Surrounded by characterless urban sprawl as far as the eye can see, the place is as magical as an econo-pack of socks on Christmas morning. But every year, Voyageur Place Hotel hosts Cherry Hill Photo and their Canada-wide assembly of Santa Claus managers. My training session began October 19 at 9am, in a fluorescent-lit basement room with a rectangle of tables draped in white cloth and set with pitchers of iced water and hard candies. It was the last of four manager-training sessions and there were roughly 25 of us assembled, including managers and assistant managers from malls across Atlantic Canada and Ontario, as well as our district managers and the head of Cherry Hill Photo’s Canadian operations, Diane Tugwell, a severely spoken woman with close-cropped grey hair. Most of the managers attending my session were repeat employees, the majority of whom were heavy-smoking middle-aged white women. Thanks to the level of experience in the room, we ploughed quickly through the first morning of training despite prolonged hourly breaks. We then ate lunch together in the Best Western dining room (annoyance was expressed over the lack of free bread, a staple in previous years), and by mid-afternoon we’d learned to operate the digital photography system, from set-up and tear-down to taking photos and printing photo packages. The following, final day of training was devoted to day-to-day operations and preparations prior to opening. It was surreal to witness the Santa machine laid bare, systematically exposed in all its component parts. Every aspect of Cherry Hill’s Santa photo business is meticulously planned, from how to file daily reports, make bank deposits and treat customers, to what Santa’s helpers should wear, how to display merchandise and what to look for when hiring Santa Clauses. Santa Claus has long been established in Western popular culture as a jolly, overweight, elderly white man with a long white beard, dressed in a red snowsuit. (The idea that Coca-Cola is responsible for Santa’s costume colours is an urban legend. The red-and-white suit was standard by the 1920s: Coke simply took advantage of this in the early ’30s when trying to figure out how to market soft drinks in the winter.) We are accosted by hundreds of Santa clones every year as they ho-ho-ho at us from posters, greeting cards, billboards and TV commercials in the weeks leading up to Christmas. 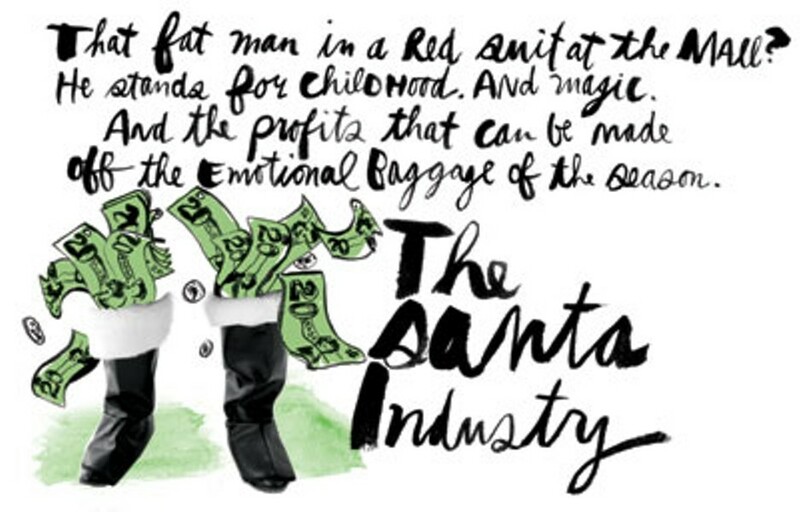 This image of Santa Claus sells and hiring the most saleable Santa means gaining an edge over the competition. According to an article by JR Moehringer that appeared in the Seattle Times, the LA Times and China’s Weekend Standard, “Top Santas can earn $60,000US a season working the ritziest malls.” (Moehringer is not referring specifically to Cherry Hill’s Santas.) “Every mall wants to say it has the real Santa under contract, to attract the maximum number of shoppers.” These heightened stakes have driven some Santas to extreme measures—from bleaching their beards and gorging on ice cream to, in one case noted on the web, undergoing eye surgery to get that special “twinkle.” Competition isn’t always pretty. Upon returning to Halifax from Newmarket, I set up interviews with everyone who applied to be a Santa at Halifax Shopping Centre. Few were suitably qualified. Several were incapable of showing up, two backed out after learning they would have to get a police check and one couldn’t be reached by phone, but left messages from his mother’s house saying I should call and tell her if I needed him. Finally, after weeks of staring blankly into the food court at the shopping centre, waiting with increasing rage for yet another no-show, I hired three Santas: Floyd, a military man near retirement; Cliff, a long-retired businessman and Daniel, a struggling actor. Each worked hard to fill the Santa suit as best he could. Every day, at the start and end of their shifts, the three men reported to the shopping centre’s security office. In a back room located beyond the front desk and surveillance monitors, they changed identity by donning (or removing) the costume: red pants, black boots, white-trimmed red jacket, wide black belt, long white beard, curling white wig, Santa hat, white gloves and granny-glasses. Daniel, the youngest and thinnest Santa, also strapped a vest of bulky pillows under his jacket and whitened his eyebrows with a grease pencil. At the end of every shift, costumes were spritzed with Febreze and hung—warm, damp and smelling of freshly-laundered BO—in half-size metal lockers. Santa’s shifts lasted between three and five hours, following which he left to “feed his reindeer.” Within 15 minutes he was replaced by a taller or shorter, thinner or fatter version of himself. On busy Saturday mornings, Santa’s hours flew by as hundreds of children were hoisted onto his lap, asked to share their Christmas wishes, photographed, handed candy and sent packing. Weekdays were much slower and Santa resorted to pacing, sitting dejectedly or singing to himself. But the drought never lasted for long and soon enough another child appeared around the corner. It was fascinating to witness children’s reactions to these previously unremarkable men. Beheld in full costume, the Santas acted as highly charged child magnets, attracting excited children from a hundred feet away while sending others diving for cover in abject terror behind parents/planters/floor displays. For scared children, a direct relationship developed between the child’s proximity to Santa and their level of fear. Parents played a crucial role in negotiating these visits and while many chose to abide by their child’s wishes, a surprising number proved more than willing to (in some cases repeatedly) force their terrified offspring to sit on Santa’s knee. A number of heartwarming photos resulted. Other kids bubbled over at the chance to sit with the Present God. Chatting, snuggling and smiling they happily shared their lists of wants and were hugged and handed some candy in return. Many continued to wave to Santa, riding backwards in strollers or twisting around from a parent’s hand, until they were out of sight. Santa’s mall oasis of Christmas decorations and photo packages wasn’t always the happiest place at the shopping centre, but excited kids generally outnumbered those in distress and it was touching to witness instances of pure, joyful belief as a child encountered her bearded hero for the first time. For parents, these moments transcended the crush of frantic shoppers, parking-lot rage and the incessant blaring of carols they had been forced to overcome to attain them. For others, the liquor and drug stores were only metres away. “Christmas spirit” is an elusive feeling. It means something different for everyone and it crosses religious, secular and personal lines. Different versions of it are for sale from Halloween on, and it doesn’t come cheap. Never is the emotional divide between product and consumer more glaring than on a busy December weekend at the mall. Over-stressed and under-funded, shoppers vie for the latest toys, games and movies, cram their carts with Christmas tchotchkes, candles and gift baskets of soap and fight to the death over parking spaces and check-out line positions. And they do it all in the name of peace, love and family. When I was growing up, I tried to feel “Christmas spirit” every day from December 1 straight through Boxing Day. I used to worry if I felt something resembling it in October, afraid that by the time Christmas came I’d have run out. I now understand Christmas spirit to be the flip-side of my Christmas hangovers. It’s the sense of being full to overflowing with goodwill and of being grateful for this feeling. I’ve stopped worrying if I feel it in June or February, or if I don’t feel it while decorating the Christmas tree or listening to carols. Sometimes being smiled at by a stranger works better than a truck-load of stocking-stuffers and there’s a limit to what Santa can bring on his sleigh. Megan Wennberg is an award-winning Halifax journalist and filmmaker whose seasonal career as a mall Santa manager ended in 2004. She misses the free candy. The Santa photo set at Halifax Shopping Centre is no longer run by Cherry Hill Photo and all proceeds go to charity. The Santa set at Mic Mac Mall is still run by Cherry Hill.